Nigeria President, Muhammadu Buhari says his government is on a rescue mission on the nation’s resources from being appropriated by “a privileged few in their never ending quest to satisfy their greed”. The President stated in his New Year message to Nigerians which was issued by his Special Adviser on Media and Publicity, Mr Femi Adesina, in Abuja on Monday. He said the All Progressives Congress-led Federal Government had resolved to build a country in which the resources were utilised for the benefit of the citizens, irrespective of their socio-political affiliations. He said: “That is the journey we have embarked on since we came on board in 2015, and we are not distracted as we move on. “We are resolved to build a country in which the resources are utilized for the benefit of the largest number, and not appropriated by a privileged few in their never ending quest to satisfy their needs. Nigerians desire peace, security, prosperity, inclusiveness and infrastructure development, a nation they can be proud of, a country that can hold its own among the nations. 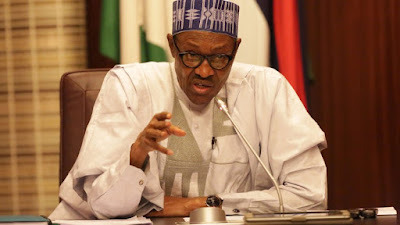 Hoscon hails Buhari over resolve on 13% derivation He, however, stated that those who continued to trumpet falsehood and negativity were on their own, fighting a losing battle. He noted that “the greater number of Nigerians are trusting and believing that we shall deliver on our promises for a level playing field at the polls, and that is what we shall do’’. He, therefore, reiterated his promises and declarations that the general elections would be free, fair and credible. “Elections need not be do or die affair, and we should not approach that eventuality in a democracy with trepidation and mortal fear. “Happily, a large number of presidential candidates have committed to peace, and peace we shall have,’’ he added. President Buhari acknowledged that the country had its challenges; ranging from security, economic, political to social, but the government had resolved to combat and overcome them all. New Year Message from President Muhammadu Buhari He, therefore, expressed the hope that Nigerians would renew the mandate they overwhelmingly gave the APC in 2015, for another term.